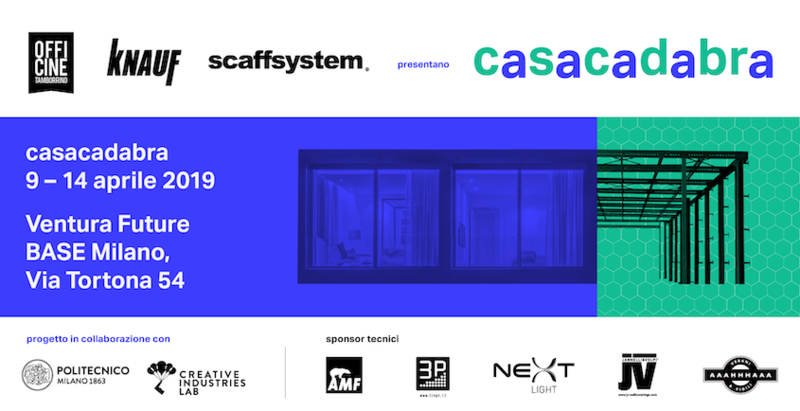 Scaffsystem, Knauf and Officine Tamborrinotogether to present CASACADABRA at the new Ventura Future in Via Tortona, where mechanics, architecture and design merge to raise dry-steel constructions in the residential sector. Sustainability and health of people are emergencies for which the world of construction must identify technical and at the same time aesthetic solutions. For this reason it was decided to propose a dry construction system to the world of design to share with designers and attendants of Milano Design Week the concepts of precision, flexibility, sustainability, safety and thermal insulation, seen as the foundations on which dry construction system is developed. Three excellences from the world of construction and living have decided with CASACADABRAto take up this challenge and define together the house of the future that aims at the best performance with the lowest environmental impact. Scaffsystem, historic Italian manufacturer specialized in steel construction systems for logistics and residential housing offer its know-how on steel working, one of the more lasting in absolute construction materials and totally recyclable, in fact interested in downcycling, being re-usable over 90% in different sectors and applications. Again thanks to the performance of steel, Scaffsystem has developed the line dedicated to building, “Structura”, with light steel sections and cold-formed profiles that guarantee lightness, extreme ease of assembly and concrete elasticity to movements, such as telluric ones. Knauf, a leader in dry construction for healthy, safe and comfortable environments, released its technology available to steel frame systems by realizing all the infills. Plasterboard and gypsum fiber solutions are in fact ideal for modern residential buildings and Knauf technologies push performance to the highest levels. All the surprising possibilities of Knauf systems to soundproof, protect from fire, being thermally efficient, protect from earthquakes and create architectural solutions impossible with any other traditional system can be appreciated in the contextual exposition of Knauf slabs and in the Knauf Tower, dedicated to Aquapanel solutions in exterior and plasterboard slabs on the inside. The “Office” room is a must-see; Knauf contributed with its highly-performing Danoline ceiling system, enriched with Topiq acoustic sails, both aesthetically beautiful and effective from the point of view of acoustic comfort. The structural solution of Scaffsystem integrated with Knauf dry systems is interpreted by Officine Tamborrinowith the aim to give life to a project with a strong design content. His sensitivity and attention to detail launches prefabricated steel house project on the most emotional and aesthetic dimension, identifying customized and functional furnishing solutions that look to different target customers. CASACADABRAwill show itself as an immersive story of the present and the future of construction systems derived from an industrialization process and in parallel will be constituted as a real experimental laboratory where testimonials and interviews will be collected. A path, by Angelo Jelmini, of almost 30 meters in length to cross to experience the different layers of this new housing model, capable of interpreting needs and identity of people through design. Starting from the soul of material, steel, the technical, technological and ethical performance of the system will be analyzed up to a more intimate, “internal” dimension, in which the idea of ​​home is expressed by the design of Officine Tamborrino. The first part of the path, analysis and knowledge, also passes by direct confrontation with Politecnico di Milanoteam with which a research is in progress for Scaffsystem and with which some important prototypes have already been made.